In my own life I have found duct tape useful for all kinds of endeavors: silencing pets, mending the spines of old books, securing children to the ceiling. Who knew, though, that this powerful adhesive is what keeps Canterbury cathedral from falling down? 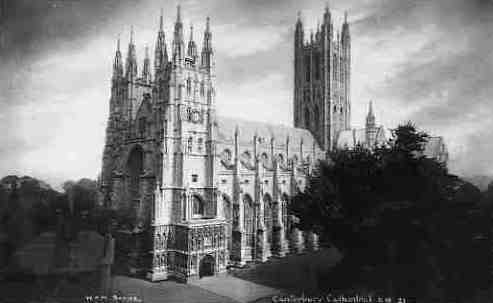 Canterbury Cathedral is falling apart at the seams, with chunks of masonry dropping off its walls and a fifth of its internal marble pillars held together by duct tape ... Heather Newton, the head of stone conservation, said that 20 per cent of the hundreds of 12th century Purbeck marble pillars that line the interior walls of the cathedral were bound with tape to prevent them crumbling. Garrison Keillor has been telling us for years how wonderful duct tape is; this is just further proof. Rick, I have taught you well. But he'd say it in Middle English or French.